Anyway, ever since I found these crazy 60's cookbooks at a church rummage sale a couple months ago, I have been keeping my eyes peeled for cookbooks and kitchen items while I'm thriftin' it up. So, Wednesday I got up early and hit some garage sales. I was only able to find 3 sales...must plan better next time. Oh well, still got some good stuff. 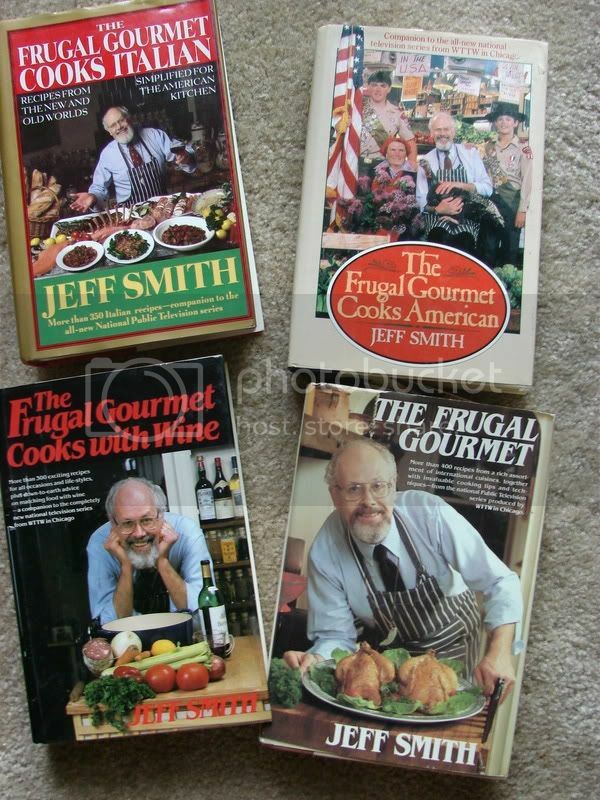 At one I got 4 Frugal Gourmet cookbooks for $1 a piece. And, no, I was not aware of Jeff Smith's legal issues when I bought them. Now I don't know that I really want to use them. I mostly got them for Jack, as he grew up watching the show every Saturday morning after cartoons. He seemed to thing it was a pretty cool purchase. And in two of the books there were bonuses from the previous owner! 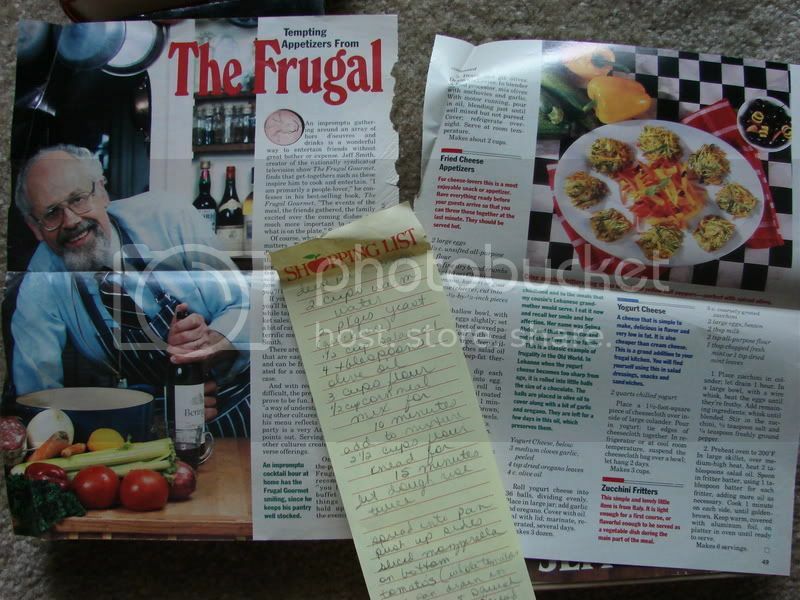 A 1989 magazine article and a handwritten deep-dish pizza recipe. I love finding tidbits like these in old books! 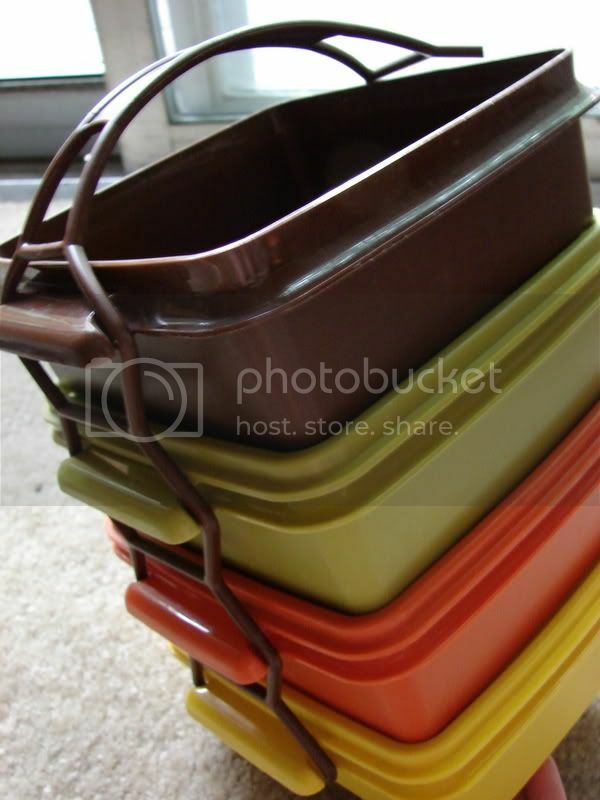 Speaking of Tupperware, check out these awesome old catalogs and ads! 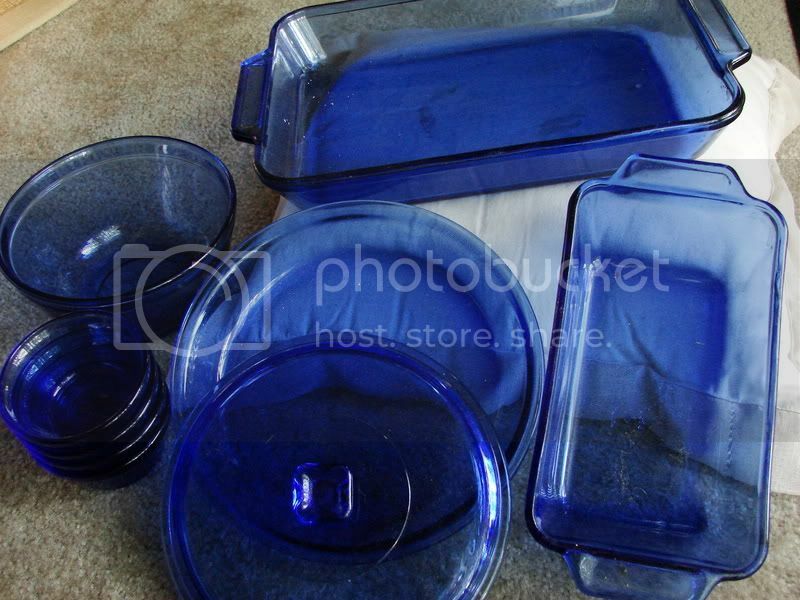 Last month I found this blue bakeware set at a garage sale for $6. It matches all my current bakeware! I was excited because I did not have a loaf pan, a pie pan, nor custard cups. And I can always use another bowl and casserole dish, right? Pretty! Back to my vacation...after eating at Carl's Drive-In, my mom and I ducked into the little used bookstore across the street while it poured rain outside. It was a nice little shop, sort of maze-like with shelves of books to the ceiling everyware. The prices weren't that great though...that's a girl's spoiled by dirt cheap books at garage sales and thrift stores opinion. I did end up finding two to buy. 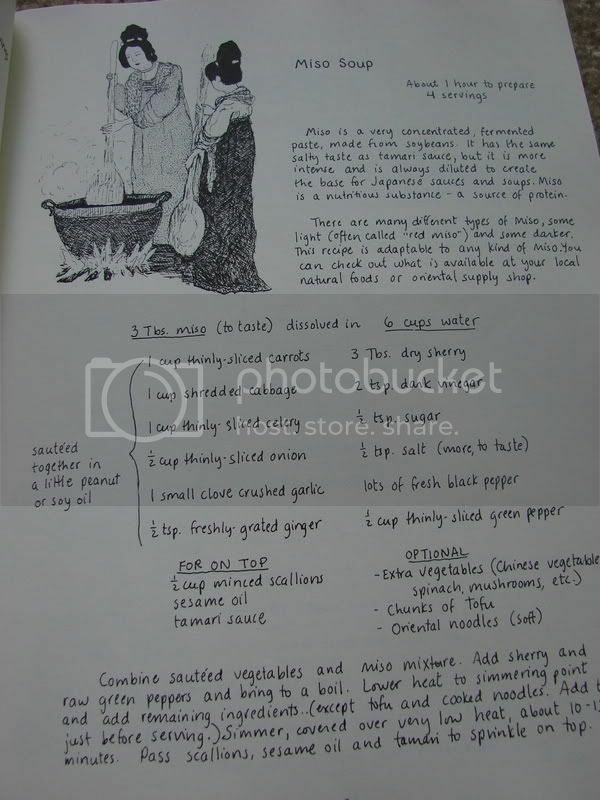 The Moosewood Cookbook, which I had been wanting for awhile now. If you're not familiar, it's a 1970's all vegetarian cookbook which was all hand written. 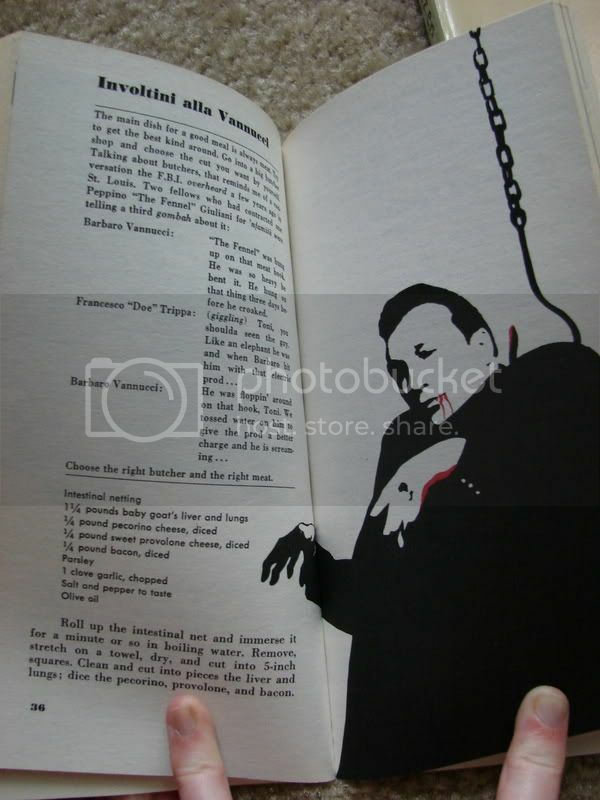 It's got lots of cute illustrations and the recipes are supposed to be good. I paid $7 for it. 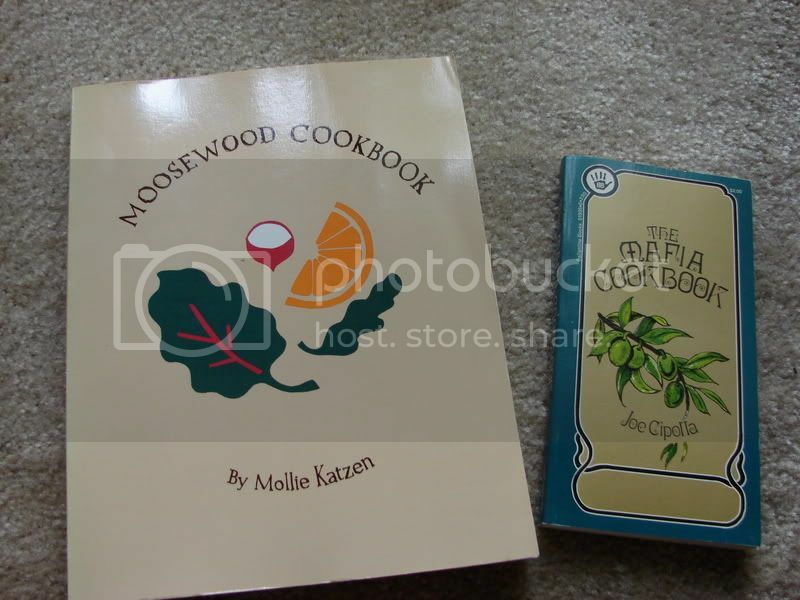 I also got my favorite find of the whole week, the Mafia Cookbook. It was published in 1970 and written by a guy name Joe Cipolla, who was actually a cook for many mafia families. It's a crazy book, the exact opposite feel of the Moosewood cookbook, what with illustrations of guns, handcuffs and guys on meathooks. This book will get it's own Iron Stef entry, for sure. I got it for $2.25. I googled it, and the only person I've found so far who's selling one has it for $91!!! Score!